I am SO there. Elite was the first game I played as if it meant something. You could easily call it the precursor to Eve, even a precursor to MMOs in general. While the screen whited out and the discdrive chugged, you could easily imagine you were out in the cold, darkness of space. Just watch out for that guy selling that small, furry thing. HELL YES, it makes me feel good I've played every game mentioned here. And Elite/Privateer were some of the most awesome "concepts" I've seen in a long time. 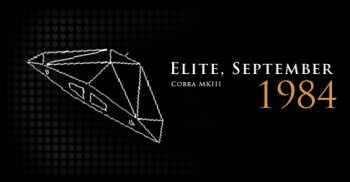 Personally I've kind of been hoping they would do a real remake of Elite and release it for XBL Arcade or the PSN store (or just for the PC). Yes I know they have done other games, but aside from maybe Elite 2 none of them really did it right. I played "Frontier: Elite II" extensively and was amazed by the vast open universe and the ability to seamlessly fly between cities on planet surfaces and space, something which I have yet to see in a modern space game. It was a good time. The frequent encounters with hostiles got a little frustrating though as combat was extremely difficuilt, often ending with the player being shot to bits in mere seconds. I only got into the Elite series in the last couple of years, but even twenty-five years after its release on the BBC Micro, Elite still feels like one of the freshest games that I've ever played. The technological prowess that must have went into fitting something that complex into a computer with such a small amount of RAM is unbelievable, and the Frontier series proves that Braben could innovate on a level with a single megabyte that most developers can't match with a full Blu-ray disc. Dang I love this game! A few years a go my mum gave both our BBCs (yes, two) to charity, not realising they are worth ALOT nowadays. I downloaded the game and it sits peacefully on my desktop. If you want to download a colour version, search oolite. Dunno why they changed the name, but its still decent. Frontier Elite 2 was great with gobsmackingly realistic space flight that makes EVE's appalling underwater fishbowl physics engine look like the lame turkey that it is. Frontier even had gravity, planetary flight, and the ability to land craft on planets, stuff that EVE's dev team will probably dither about for another ten years at least before even thinking about implementing (especially at the rate they're going currently with Walking In Stations). The combat was a bit unworkable though with most enemy ships simply suiciding against your hull, but the original Elite has good (if less realistic) combat. If someone wants to do a space MMO they should just do Frontier as an MMO but without the bugs. Oh and with walking in stations, and in ships and on planets. A decent dev team could probably knock all that up in the amount of time it takes CCP to bling out an asteroid. Elite! Too bad the series never really went anywhere and petered out after awhile (oh wait, i mean the entire space genre.) even though they were great. All you need to do is fly directly above them so your shields scream and the launch a missile. Even if they ECM the blast hits their hull.